Miss “That Catholic Show”? You’ll Love This. I was given the task a couple weeks out from the release to develop some resources to accompany the letter. So instead of going to work one day, I sat in my truck in a park facing the front range of the Rocky Mountains and wrote 20 Family-Friendly Rosary Meditations, a Month of Dinnertime Conversation Questions, and the script for the video above. My team at the Archdiocese then worked to film, edit, and revise all of these resources to coincide with the release of the pastoral letter and are now available, along with the pastoral letter, on the new Archdiocese of Denver website. I sincerely hope you enjoy these and will use them in your own homes. Feel free to link to all of these from your own website, Twitter feed, or Facebook page! 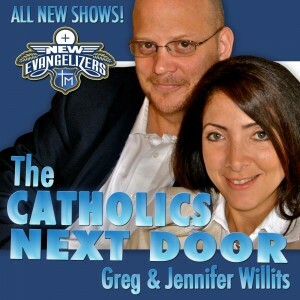 Since 2008 my wife, Jennifer, and I have hosted a 3-hour-a-day talk show on SiriusXM’s The Catholic Channel called The Catholics Next Door. Prior to that, for several years we hosted the award-winning Rosary Army Catholic Podcast, which was the first husband/wife Catholic podcast. Both shows were a tremendous joy for us and I believe with every ounce of my being that I’m a better person today than before I started those endeavors. But because of family obligations and her inability to continue hosting the show in the afternoon (right when the kids got home from school), last July Jennifer had to step down from the show to step back up to being a full-time mom, and for the past three months I hosted the show solo. We knew when we made that decision that there was a good chance that in the long run, our show would no longer air on SiriusXM, and understandably so. They have a channel to run, and though the show was still great (if I say so myself), it just wasn’t the same without Jennifer. 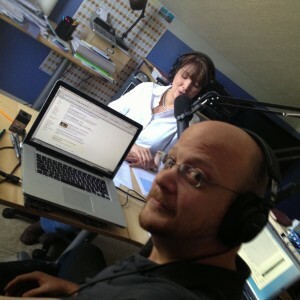 Last Friday (October 19, 2012), we hosted our last broadcast of The Catholics Next Door on The Catholic Channel, and it was obviously a bittersweet experience. But we knew that because so many people had benefitted from the ministry of The Catholics Next Door, that we needed to find a way to expand it new and exciting directions that weren’t always possible with radio. It had to continue. We actually knew for almost an entire month that our show was going off the air, and in that time we did a lot of praying, crying, laughing, hoping, and discerning. Part of that discernment process lead to the decision to focus my creativity, passion, skills, and experience towards producing more great audio and video content, while also helping others to be more productive and effective in their organizations and endeavors, both in faith-based initiatives, as well as more business and IT related companies. In the midst of that, I got a little bold. I told Jennifer that if we were going to relaunch The Catholics Next Door as a podcast, that we’d need to have a sponsor for the show from the very first episode. If I was going to try to support the family as a freelance contractor, I couldn’t give up a day each week to do a show that would make it impossible for me to do work to support the family. Then I threw in a few caveats, just for good measure. I can’t lie. Just can’t do it. If we’re going to have a sponsor, it has to be one I believe in. It has to be one doing some level of good. And it has to be one who gets what my wife and I try to accomplish in all of our various media endeavors. What we do in video and audio is unique and different and we wanted a sponsor who “gets” that. We knew our last radio broadcast was quickly approaching, and people would be asking us to start a podcast, or if we’d be moving the program to another network. We needed an answer before our final show. I said a prayer, wrote down some details, sent off a couple emails, and within 24 hours, we had our first sponsor for the first 12 shows: eCatholic – Catholic Websites Made Easy. Given the geeky nature of so much of what we do, combined with our love for new media and new evangelization, God brought us a perfect first sponsor. And while that in itself is great, what’s even better is how excited our sponsor is to be a part of a brand new, relaunched The Catholics Next Door. Even though the first new show doesn’t launch until October 29th, our sponsor has already created a fantastic deal for our audience and friends. But it doesn’t end there. I just found out that not only are they sponsoring our new show (click here to subscribe for free via iTunes), but they’re running a contest this week for you to win a free copy of our book, The Catholics Next Door: Adventures in Imperfect Living! Click here for more information on how you can win! We’re so excited for the relaunch next week. Our plan is for the new show to be a combination of the best of our old podcast, with the best of our radio show, all mashed up into something unique and awesome. Oh, and if your company or organization would like to be a sponsor, drop me a line. I’d be happy to discuss the possibility.